Modifications: I worked the toe-up version found here, and did four rounds of garter stitch for the cuff (on the smaller needles). 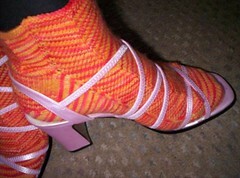 I also did the heel turn at twice the normal rate because I'd done too many rows in the foot portion. It's all good! Notes and comments: I love these socks. I don't think I'd goes as far as Cara has (is it 7 and counting now? 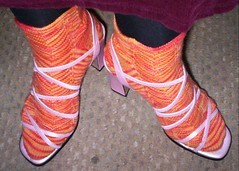 ), but I can see myself knitting theses again sometime soon. I love the shoe-sock combo. Now that's how you show off Jaywalkers!